Cubism can be regarded as a 20th Century Art Movement. Although it began in the art world, it slowly began to influence the design of products, ranging from furniture to architecture. One of the artists that helped establish cubism was Pablo Picasso. Picasso’s art represented objects and sometimes people as broken up, into an abstract form. The aim was to present the object from an alternative view point, in order to provoke thinking and discussion. 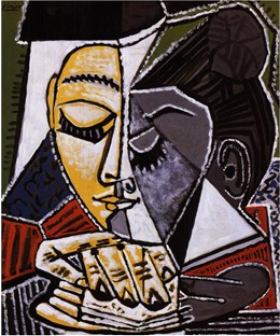 The work of Picasso shown below, displays some of the characteristics of Cubist Artwork. The original scenes represented by each of the paintings, have been broken up and arranged producing an abstract form. Cubist art rarely shows depth and lacks a 3D quality. The paintings are seen as two dimensional, often with geometrical shapes, dominating the painting. This branch of Cubism took natural shapes and forms and reduced them to geometrical shapes. Colour was often reduced to shades of gray and/or blues. Analytic Cubism dissected one subject and put it back together, forming intersecting geometrical shapes. 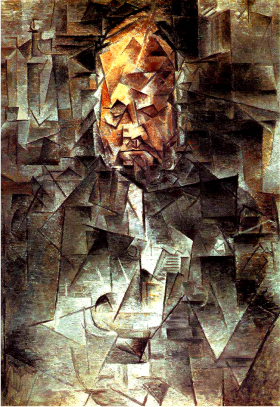 Picasso's "Portrait of Ambroise Vollard"
During this second phase of cubism, colour shade and texture were explored, often applied to the same canvas. This stage of Cubism is also characterised by different subject matter being presented on the same painting, forming interlocking geometrical shapes.. Subject matter is arranged almost as a collage.